I received the following note from a reader here, and this prompted me to dive into the archives. Do you know if the old TTC tokens have been redesigned since the 1950s? I have a token that looks completely different from any of the tokens currently in use (with the TTC coat of arms etc; not the bimetallic ones). It simply says “Toronto Transit Commission” around the edge and the word “Subway” across the middle. Could this be a very old token or is it a fake? This is an older type of token. The illustration below (click to open the larger version) contains three token holders of various vintages in the form that tokens were then sold. 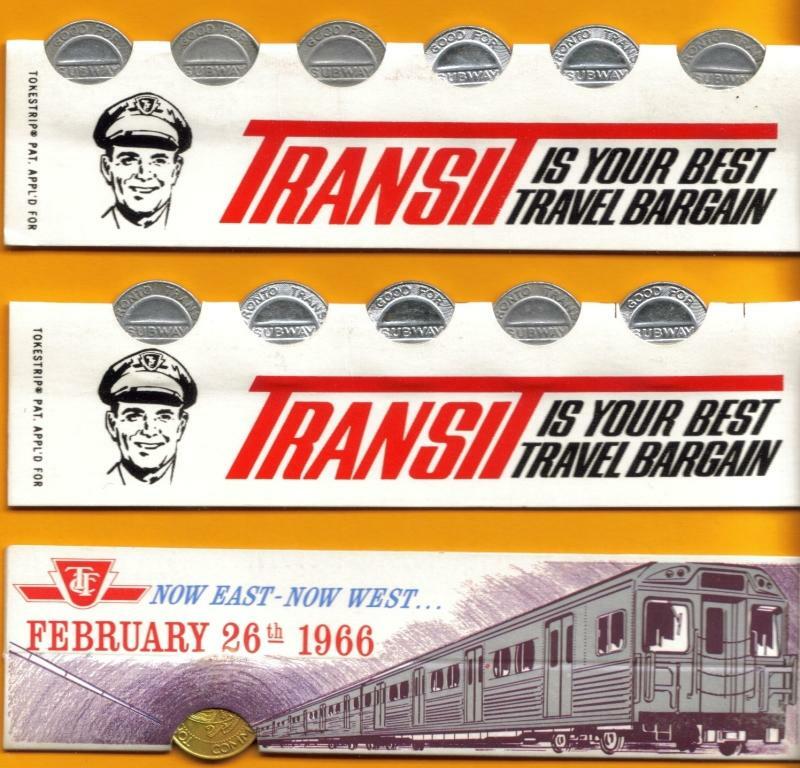 There are both the 6/$1 and 5/$1 version dating from the late 1960s, as well as a single token holder that was a complimentary “first day cover” for the Bloor-Danforth subway. Note that this last one is a brass token, the format used for single-token sales. If you look at the regular tokens, you will see that they match the one you have. Why stop at 1966, I thought. Let’s go back a bit further. The next pair of images are front and back scans of some pre-TTC fare media. 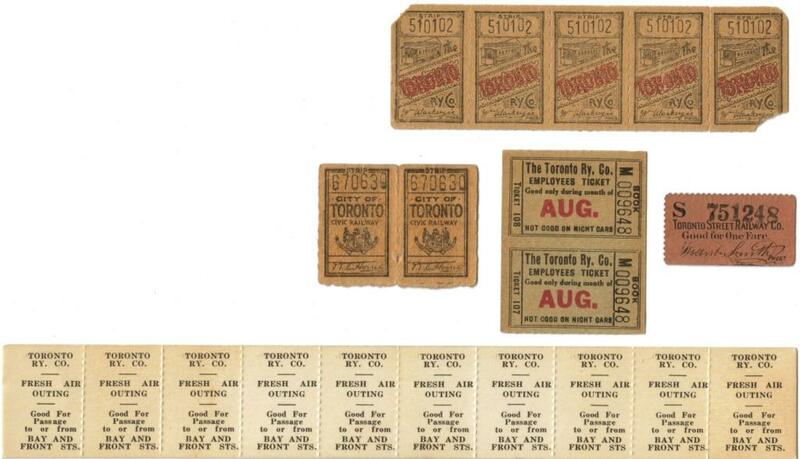 The red ticket is from the Toronto Street Railway. The TSR was replaced by the Toronto Railway Company in 1891, and by 1911 when the TRC refused to extend its network, the city set up its own company, the Toronto Civic Railway. These two, plus other bits and pieces, merged into the TTC in 1921. The TRC tickets are interesting for a number of reasons. First is the little picture of the electric trolley car. The TRC was granted its franchise with the express purpose of electrifying the street railway, and so an electric car was central to their purpose. 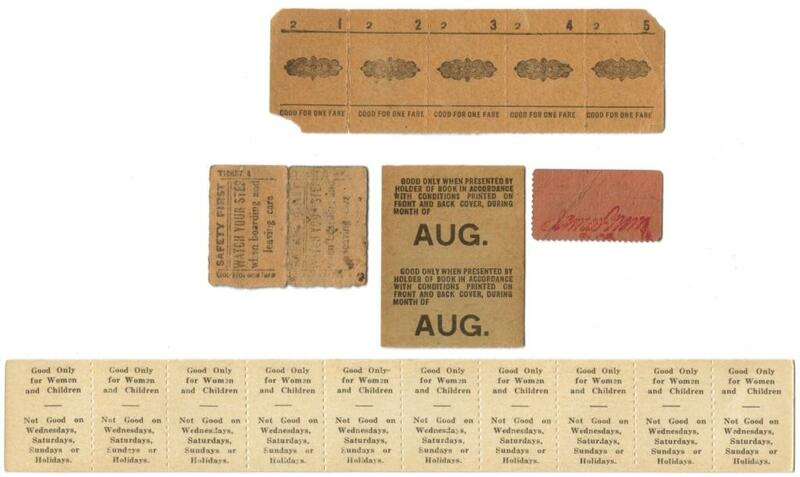 Next, you will see that there were special tickets for employees that had restrictions on time of use. Finally, there is the strip of Ferry Service tickets good only for women and children travelling to the docks (note that the service did not yet cross south of the railway corridor, and the destination is Bay and Front).